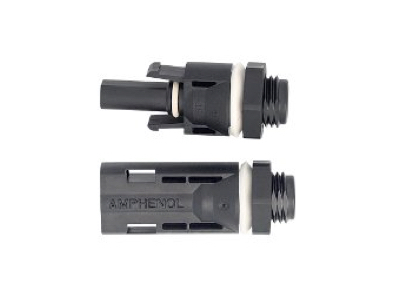 Amphenol Industrial Solar Technologies’ H4 PV Panel Connector is the premiere solar panel connector in the market today. Carries more amps than the industry standard connector. Meets the NEC 2008/2011 standard “as is” no additional components required. Available in four different gauges: 31A(2.5mm2, AWG14), 42A(4.0mm2, AWG12), 53A(6.0mm2, AWG10), 65A(10.0mm2, AWG8).